What happens when maximize profits at all costs mentality trickles down from the hybrid regime? How Msia's Johor State(transparency) is helping to bring down SG's hybrid regime? A few days ago, it was reported that OCBC bank pulls plug on Cycle Singapore. It is understood the 'divorce' happened because of a cyclist death. Bukit Timah Nature Reserve to close for at least 6 months. Even nature reserve can't withstand overpopulation so mishaps are just waiting to happen when the organizer is squeezing as many bodies into the cycling event in order to maximize profits. There's nothing wrong with maximizing profits. What's wrong is there is inadequate infrastructure & medics to support the event. Doesn't it sound familiar like the beds waiting along corridors in our public hospitals because of bed shortage amid overpopulation? I've never taken part in OCBC Cycle as i consider it overpriced. Overpriced services for fucked up experience is becoming the norm in this tiny island. The latest is exorbitant World Cup subscription fees for fucked up service - Complaints persist over SingTel’s World Cup package. Supporters of the grossly overpaid hybrid regime like to compare us to other 'lesser countries' & say we ought to feel grateful. I have to say there's no need to overpay for a decent service/experience. Now for my personal experience to addon. Let's compare Sillypore's overpriced cycling event to a free cycling event in JB Arts Festival 2012 just across our shore in neighboring Johor. Too bad they didn't have the event with part of the route winding through JB's old streets(arts) & central business district last year. This is Jalan Abu Bakar, the coastal road in Johor, Msia which is opposite Kranji, SG. 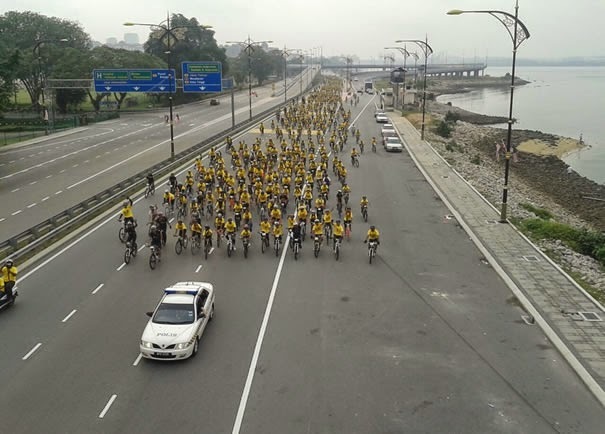 Look at the length of the cycling convoy. It practically stretches to the horizon as the above photo by the organizer shows. Look at the other side of the road which is practically empty since it is public holiday on a morning. Look at police car leading the cycling convoy. When organizers in SG organize the events, police costs, road disruptions(economic losses) are factored into the price of the ticket. Not so in neighboring Msia when they are already paid with taxpayers $$$. Look at the 3 traffic police with white helmets on motorbikes on the left. Again look at how little traffic on other side. Minimal economic losses since public holiday. Those cyclists wearing black are the safety cyclists. It is a leisure ride with family wholesome goodness when photos of kiddy girl Riding Oversized Bicycle to Save $$$ (blogpost) can participate. Yes, the mum is a safety cyclist but the kid can handle it on her own in the big convoy. When the traffic police stop traffic for the convoy to u-turn back, the drivers are patient & don't horn. The experience is fantastic & i'm mightily impressed. Still considering to sign up for next year's overpriced local cycling event if you are a cyclist? It would be better to spend your $$$ in other countries. Issues about the transparency of SG peasants retirement funds are in the limelight recently. As budget airlines & well just a bicycle ride across the border will expose peasants to other 'lesser countries' higher transparency standards, the overpaid hybrid regime will eventually be dislodged from their dominant power. 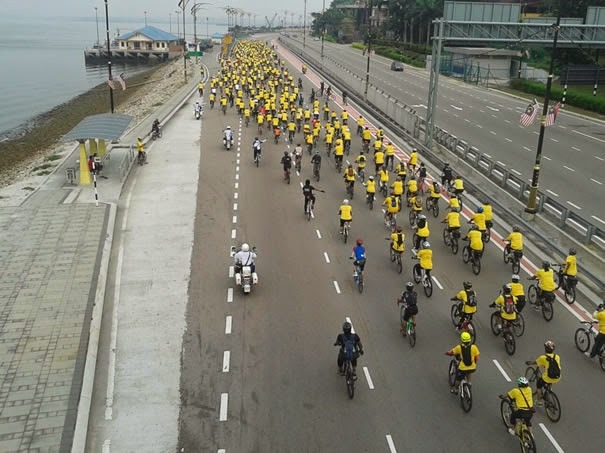 How transparent is the free cycling event organised in Johor, Msia? I suggest you visit JB Arts Festival Malaysia & click on Festival Report to see it for yourself. With such high transparency standards from an arts festival just across the border, how can the hybrid regime deserve their obscene salaries with such low standards? Their votes will continue to plummet just like the dissatisfaction over the fucked up overpriced World Cup telecast standard. Very insight article again! Thank you for shedding light on this matter. Would love to read about your thoughts on the latest changes in ippt test in the next post!